I’ve done a lot of book reviews, but I’ve never read a nonfiction book more painful and eye-opening than Wayne Kernochan’s book. His memories are laid down bare, and the narrative is a staccato, matter-of-fact voice, almost like an old-fashioned light-bulb interrogation in a faded police movie. The abuse he describes during his years at the Elan school is shocking and sad. I can’t imagine anyone benefiting from beatings, emotional abuse and humiliation, let alone an entire facility thinking this program would be a good idea for teenagers with emotional problems. The description is powerful, and occasionally it literally is blow-by-blow as teens are beaten for hours or forced to fight with each other. His recollections paint a vivid picture of inmates in charge of the asylum, ramping up the violence through control and frustration. There’s no mention of licensed therapists or other professionals intervening, which should be a chilling thought to any parent. Even with the epilogue mentioning that the school finally closed in 2011, there doesn’t seem to be a happy ending here, and one would imagine that most of the kids processed through this facility suffer from PTSD at the least. Kernochan himself mentions that he went on to prison afterward. As for the book’s style, I was a bit lost in the beginning, but that may have been the author’s choice to simulate his own innocence going into Elan. His personal history is mentioned later in the book, but I think it could be even more effective interspersed between the memories of Elan, showing his life before, during and even afterward. All together, it’s a young life torn asunder by ignorance and aggression, recorded for history’s sake by one brave survivor. 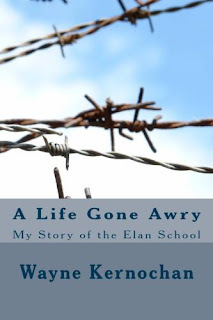 A LIFE GONE AWRY: MY STORY OF THE ELAN SCHOOL by Wayne Kernochan is available through Amazon in Kindle format.